Amid talks of a complete reboot and much cheaper hardware in Android One's original Indian market, Google's economical partnership with regional handset manufacturers continues to expand. 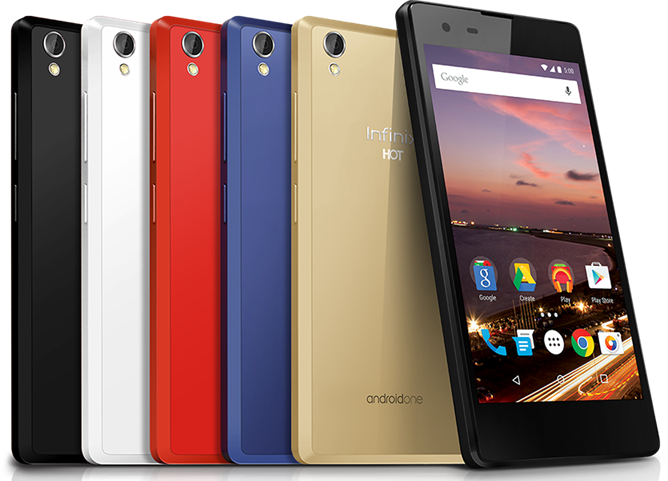 Today the company announced Android One's first availability in Africa with the Infinix HOT 2. The phone will be sold in Nigeria for N17,500 (about $88) starting today, after which it will expand into more countries: Egypt, Ghana, The Ivory Coast, Kenya, and Morocco. The Infinix HOT 2 (why do all Android One phones have terrible names?) is fairly similar to the other semi-standard phones: MediaTek processor, dual-SIM capability, 1GB of memory. It does vary from the blueprint a bit, because the gold model shown above will be offered with 2GB of RAM and presumably a small price increase. Google also announced that it's disseminating a custom bandwidth-sipping version of its Google Search application to low-powered phones in select markets, and YouTube Offline will be enabled in Egypt, Ghana, Kenya, and Nigeria "within the next few months." Nigerian residents can buy the Infinix HOT 2 via the Jumia online retailer starting today (though there doesn't appear to be a listing at the time of writing), along with brick-and-mortar retailers. The phone will be sold in the other countries over the next few weeks, and Google has already confirmed an upgrade to Android Marshmallow, though it will come "according to Infinix’s schedule."